Fairfield County Engineer's Office located in Lancaster, Ohio. 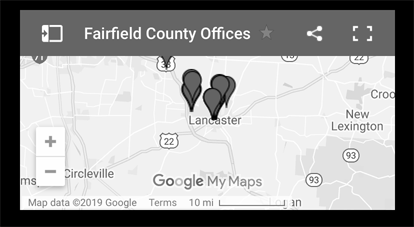 Fairfield County Engineer's Office, Lancaster, Ohio. CONTINUE TO WATCH THIS PAGE FOR UPDATES! Jeremiah D. Upp, P.E., P.S. 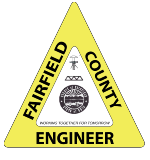 The principal duties of the Fairfield County Engineer include the responsibility for all maintenance, repair, widening, resurfacing, traffic control, mowing, and snow removal of the 363+ miles of County Roads. The County Engineer is also responsible for the maintenance, inspection, and replacement of 342 bridges on County Roads as well as those on Township Roads in all unincorporated areas of the County. 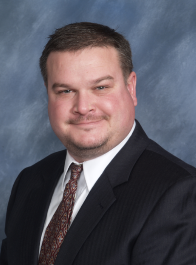 Additionally, the County Engineer is charged with the responsibility for certain bridges within municipalities, especially those along the State Highway system. Annual inspections are conducted and specific bridge condition reporting is required for each structure. 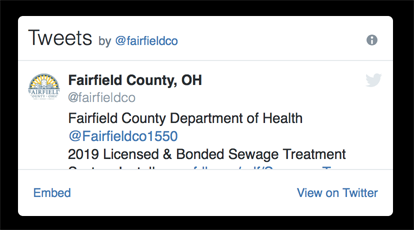 Also, there are more than 2200 culverts on the county inventory which the Engineer must maintain, repair, or replace. © 2019 Fairfield County Engineer, Lancaster, Ohio 43130 - All rights reserved.